Following the reporting of an alleged explosion or fire that took place in the Parchin military complex on Sunday October 5, 2014, ISIS has purchased and analysed commercial satellite imagery in order to attempt to locate the specific site of the incident. After analyzing the sections of the Parchin military complex visible in satellite imagery, ISIS believes that one site located in the southern section of the complex could be the possible location of the explosion. This site is close to a series of bunkers, indicating that it could serve as a support area for the activities taking place there. Several signatures that coincide with those expected from an explosion site are visible here. Two buildings that were present in August 2014 are no longer there, while a third building appears to be severely damaged. In total at least six buildings appear damaged or destroyed. Several trucks are present at the site. The shape and size of these trucks is consistent with those of either fire or debris removal trucks. The irregular line and color of the vegetation seems to indicate that some unexpected activity took place (possibly a fire, explosion, scattering of debris etc.). Finally, grey debris is visible at the center of the potential explosion area and is also scattered into the surrouding vegetation. However, it is important to highlight that a section of the Parchin military complex was not analyzed by ISIS because it was missing from the most recent satellite imagery purchased from Airbus for unexplained reasons. This site is believed to house many buildings possibly dedicated to munition manufacturing, location where an explosion could potentially take place. Therefore, ISIS will be waiting for additional satellite imagery before reaching a final conclusion on the location of the blast. Earlier today, it has been reported that the imagery shows that the damage is consistent with an attack against bunkers and that the locality is adjacent to another installation where work was being conducted that involves controlled detonation of fuses intended to serve as triggers for nuclear devices. However, it is important to note that there is no evidence of either an attack or nuclear weapon-related activities at this specific site. There may be confusion over alleged high explosive nuclear weapon- related activities at another site at Parchin that occurred prior to 2004 (see figure 1). Figure 1. 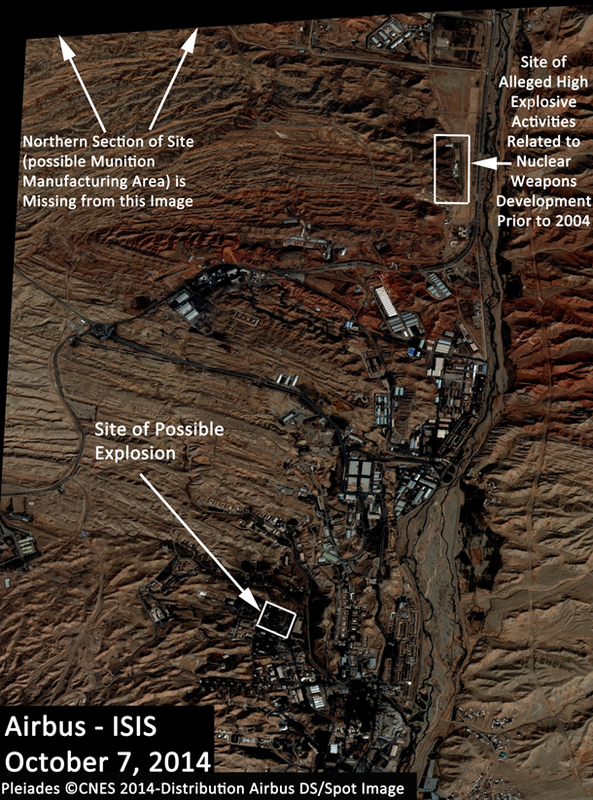 Airbus imagery showing the Parchin Military Complex in Iran on October 7, 2014 one day after a reported explosion. Figure 2. 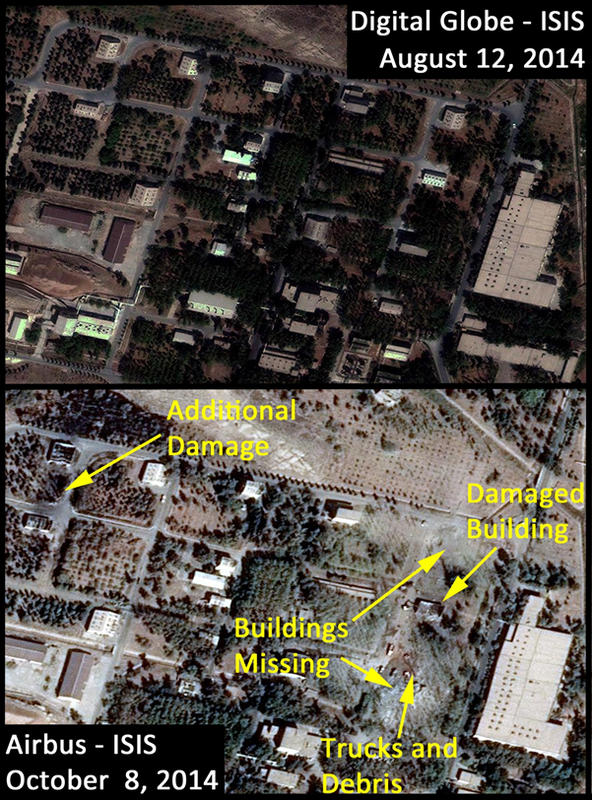 Before and after imagery of a possible site of the reported explosion. Digital Globe imagery from August 12, 2014 and Airbus imagery from October 7, 2014. Joseph Bermudez and Stephen Wood are co-founders of Allsource Analysis, INC., http://allsourceanalysis.com/.